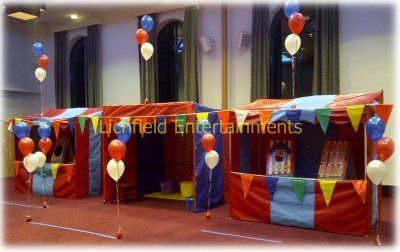 Our Fairground style Side Stall hire gives you the opportunity to bring all the fun of the fair to your own funday, party, or promotion. 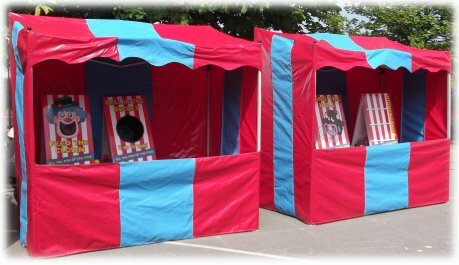 The side stall games we have available for hire include the fairground favourites Hook a Duck, Ball in a Bucket, Ring the Bull, Coconut Shy, Tin Can Alley, Crossbow Shoot and Play Your Cards Rights. These side stalls are suitable for nearly all ages and are therefore perfect for family events. The games are normally supplied in a traditional style side stall complete with a uniformed member of staff to run the attraction for you. 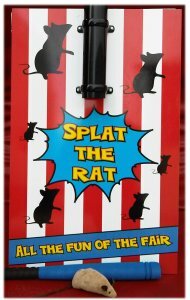 The side stall games can be played just for fun or we can supply prizes if required. 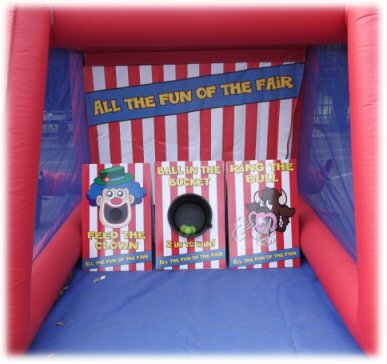 While we normally supply the side stall games in individual stalls it is possible to combine some of the games so you have two games into one stall which can save on the cost. 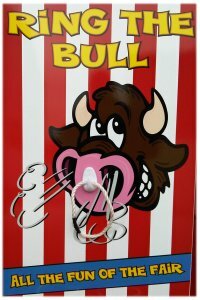 We also have stand alone games such as High Strikers to test your strength, and a Milk the Cow game. Each traditional side stall measures approx 8x5ft and requires a height clearance of 8ft 6in. 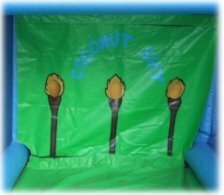 If space is more limited we have a smaller inflatable side stall that measures 6x8ft and needs just 7ft height clearance. The Side Stalls can be used either indoors or outdoors. For evening events we'll supply stall lighting free of charge. Choose a Duck, Hook the Duck, turn it over and see if you're a winner! Probably the most simple of side stall games and always a favourite. The side stall is supplied with a uniformed operator to run it on your behalf and prizes for the successful players can be provided if required at additional cost. 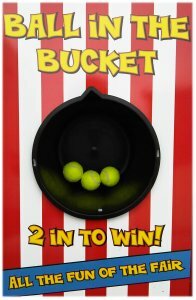 Throw the balls into the bucket and if they stay in there you're a winner! Sounds easy doesn't it? Try it and see, it's frustratingly addictive. A great game for children and adults alike. Supplied with uniformed operator. Prizes for the winners are an optional extra. 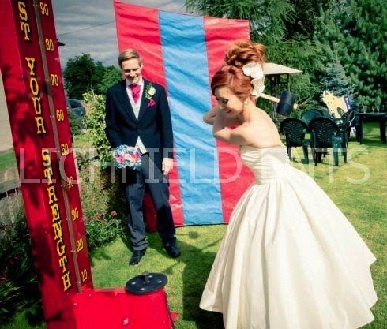 A traditional side stall throwing game. Knock all the cans in the stack over with three bean bags and you've won! Supplied with uniformed operator and winners prizes are an optional extra. You have three attempts to 'Splat the Rat' as it appears from the bottom of the drain pipe. A reaction game thats great fun for all ages. Supplied with uniformed operator and prizes at an extra cost if required. Probably the most popular of all side stall games. You have three attempts to knock the coconut from the stand with a ball. If you're successful you win a nice edible prize! Supplied with uniformed operator and a whole pile of prize coconuts. You have three chances to throw the rope hoops and 'ring the bull' to win. Supplied with uniformed operator and prizes are available as an optional extra. 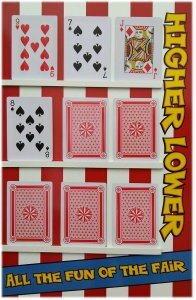 You choose higher or lower as you work through the series of playing cards. The further you go the bigger the prize. Supplied with uniformed operator and range of prizes for the game winners are available at extra cost if needed. Test your strength with a modern version of the traditional High Striker. Suitable for use by kids and adults alike and features variable resistance so it can be adjusted depending on it being used by children or adults. Take your seat on the milking stool, role up your sleeves, grab your pail and see how you much milk (actually water) you can squeeze out of the udder in 60seconds. 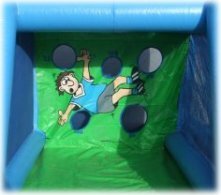 Our Inflata-Game inflatables are available as Golf Chipping, a Coconut Shy, Mini-Archery (for normal Archery hire sessions click ARCHERY HIRE ), and Football Target and Speed Radar games. Football Penalty Shootout - Each player has three shots to score as many points as possible. Golf Chipping - Try and chip the golf balls (air-flow or real) through the target holes. The amount of points scored depends on the size of the target hole chipped through. The inflatable is completely enclosed so you don't have to worry about stray golf balls! 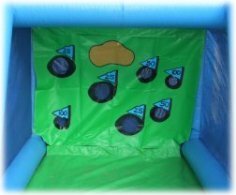 Inflatable Coconut Shy - Three target holes in the coconut shy style backdrop to for participants to aim at. Enclosed inflatables means no stray balls to worry about. Inflatable Crossbow Game - The backdrop has five clear vinyl pockets into which targets are inserted or alternatively pictures of people you want to shoot - Bosses, Politicians, and Celebrities are always popular target pictures! The Mini-Crossbows fire rubber-sucker tipped arrows for total safety. Huge fun for Sports Days, Fun Days, family get togethers, BBQ's etc. These games can be linked up to provide a smart looking row of games. 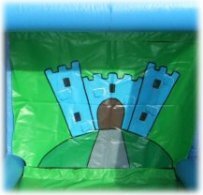 If you have any queries, questions, or would like to book an Inflata-Frame game for your party or event please call us on the number below or click to enquire and we will do all we can to help.